While at Tri-C, Schaffer immersed herself in the college experience, joining the Phi Theta Kappa Honor Society at Eastern Campus (she was eventually named president of the award-winning chapter). Her interest in journalism led her to The Voice, the College’s independent student newspaper, where she ascended to the campus editor position. Schaffer was selected for the inaugural class of future leaders attending Tri-C’s Jack, Joseph and Morton Mandel Humanities Center, and called the leadership program “Training 101” for her future aspirations. 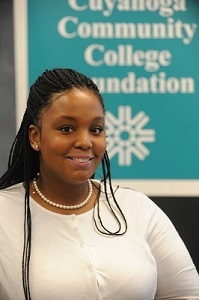 The Tri-C Foundation and Frances M. Franklin Scholarship recipient was named a 2016 Coca-Cola Community College Academic Team Scholar, a national award recognizing students for leadership, community service and academic excellence. She also earned a spot on the All-Ohio Community College Academic Team, which honors top students at the state’s two-year schools.